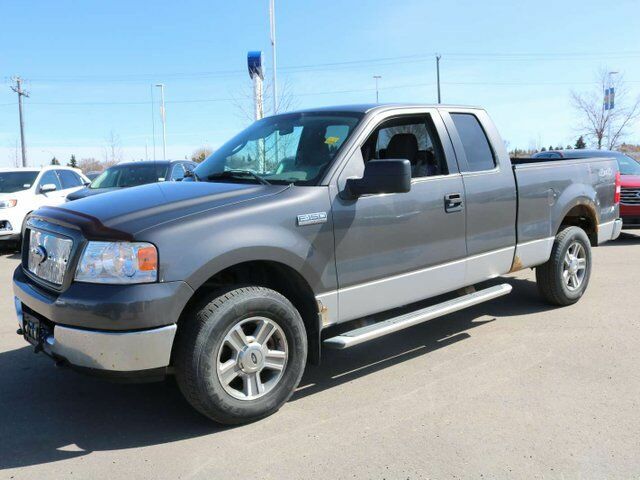 Get behind the wheel of our 2005 Ford F-150 XLT SuperCab 4X4 shown off in Grey! Powered by a 4.6 Litre V8 generating plenty of power when mated to a 4 Speed Automatic transmission. You can expect this Four Wheel Drive Ford to secure nearly 13.1 L/100km on the open road. Ready for work or play our F-150 shows off a bold stance with chrome bumpers, a chrome grille, alloy wheels, and running boards. This XLT boasts comfortable cloth seating and many other amenities. Turn up the AM/FM stereo with a CD player, set the cruise control, and take off! Other creature comforts include power accessories, air conditioning, smart storage spaces, and plenty of legroom for you and your passengers! This Ford is an absolute class leader when it comes to safety, comfort, and handling. With ABS, plenty of airbags, and the confidence of Four Wheel Drive, you won't need to worry about the safety of you or your passengers. Our Ford F-150 XLT delivers a combination of style, interior comfort, and performance, that's hard to beat. Print this page and call us Now... We Know You Will Enjoy Your Test Drive Towards Ownership! AMVIC Licensed Dealer.